We all want to run successful App Install campaigns. In order to ensure that your campaigns perform optimally, we decided to share some best practices on how to set up your app campaign, measure your success and how to reach the most valuable customers. Awareness: You can choose to have your campaign optimized for video views or by selecting Video Views as your optimization method. Optionally you can choose link click optimization, in case you have no videos to be promoted. We recommend such objectives when advertisers want to increase the App awareness and at the same time leverage the app ads features of utilizing the App ads CTA and App exclusion targeting. Consideration: You can simply optimize your campaigns for App install if an objective is clearly just App install. This is the recommended approach as you allow Facebook to find the best people for your app based on the criteria you set, such as budget, targeting or bid. Conversion: When you are willing to not only acquire customers to install the app but to take specific actions inside your app, we recommend using App event optimization. When it comes to Awareness and Consideration objectives, these seem to be simple and easy to optimize and measure. We can, however, talk in more detail about App Event Optimization (AEO) and the best optimization practices when it comes towards your goals. 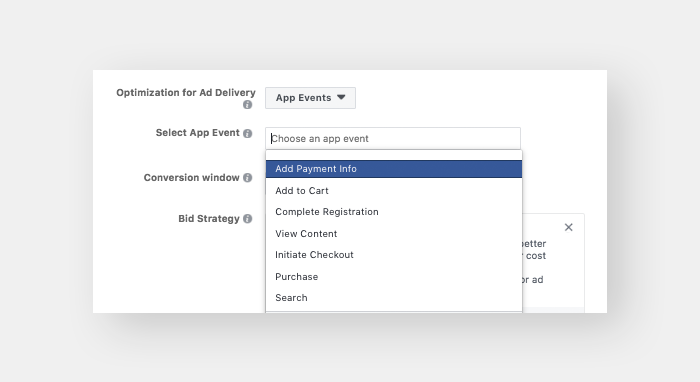 To use App Event Optimization, the first thing is to make sure you've installed the Facebook SDK and Setup app events on your app. Adding SDK events helps you to view Facebook analytics, measure ad performance, and build audiences for ad targeting. Facebook allows the setup of 14 standard App Events and advertisers can optimize their ads to reach people who are most likely to perform those certain events within your app. Using App Events for AEO can not only help you increases installs but also post-install actions at the same time. All of this within a single app install ad campaign. For example, if you are planning to run a campaign not only to get people to install your e-commerce app, but also view the products listed. Using AEO, you can optimize your ads for an app event such as View content, Add to cart or Purchase. This way your ads will be shown to people who are likely to download your app and also View content or add products to cart. You could even optimize for in-app purchases using the "Purchased" app event in AEO. Traffic objective is used when your focus is to get users to open the app. Conversion objective is used to drive specific action inside the app and you can directly optimize for that to re-engage people who abandoned a cart, haven't completed a purchase or any other actions you choose as a goal. 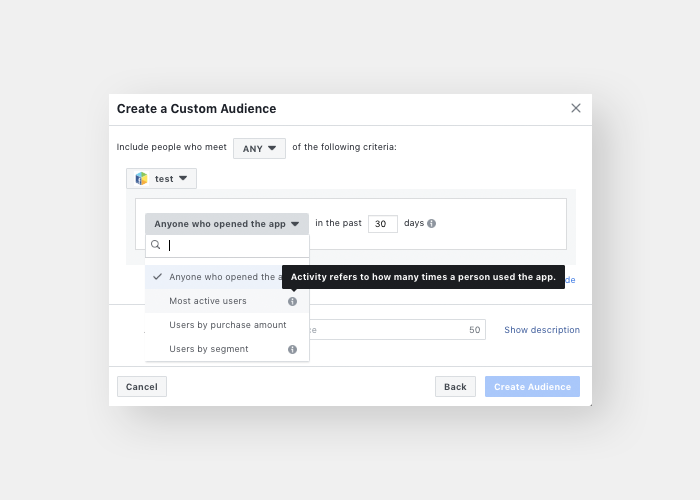 With custom audiences, you can retarget campaigns to people to bring them back to your app using dynamic rules of your definition. Additionally, you can optimize campaigns for the app events you choose, which allow you to focus on conversions or the other actions you choose. You can always create a split test to test between multiple optimization goals or test between install only and Install+event optimization practice without any overlapping between the audiences. Deciding on you targeting is one of the key steps when planning a Mobile Installs Campaign on Facebook. It’s important to know the category of people you feel best suited for your app. Rather than caring about just standard demography and interest targets, advertisers should also consider Devices (iPhone 6, Samsung Galaxy, iPad, etc.) and Operating System (iOS6, JellyBean, etc.) the app work best with. You can also consider targeting Similar Apps and Lookalike of your existing app users. Finally, you can also create "lookalike audiences" to target campaigns to new people who are similar to your best customers. We can also refine the audience on the basis of user’s activity for example to target top 5% to 25% active users inside the app. Ensure a clear call to action you want people to take. Use a device in the ads to make your ads feel like the true experience by showcasing your app within devices. You can also consider offering promotions where applicable. Finally, you can customize the images or videos people see in your ads depending on where those ads appear using the asset customization feature in Ads Manager. Using ROI Hunter Video Editor you can even create stunning, interactive video ads for your products. All of this at scale and within minutes! Learn more about this feature here. You can promote relevant items from an entire catalog across any device, display ads for thousands of items to the right audience and automate the process. This feature has proven to drive app install at lower cost In order to run DPA for App install, you need to associate a catalog with your campaign and select the products from your feed, filter the products on the basis of elements such as brand, category, price, gender or others and enhance the images. You can do all this in bulk using our ROI Hunter Template Editor. Dynamic Creative Optimization, a feature where you combine a lot of texts, headlines, and images to reach the right audience with the right creative. Dinda, one of our e-commerce clients in Brazil has seen a reduced cost per installs by 44% in all devices (iOS and Android) and brought 91% more installs in Android and 2X more in iOS. More information about DCO is available in this article. Measuring all your campaigns, to identify which work best and why helps improve your advertising strategy for app campaigns. You should always understand the activity happening within the app. For example, how many people opened the app, added products to the cart or purchased. You can view post install results from your mobile app install ad campaigns in Ads Manager. You can view the metrics associated with the revenue gained from your install ad campaigns, for example; average revenue per user (ARPU), revenue, cost per purchase and more. You can only view these metrics if you log purchase events and the revenue for your app. 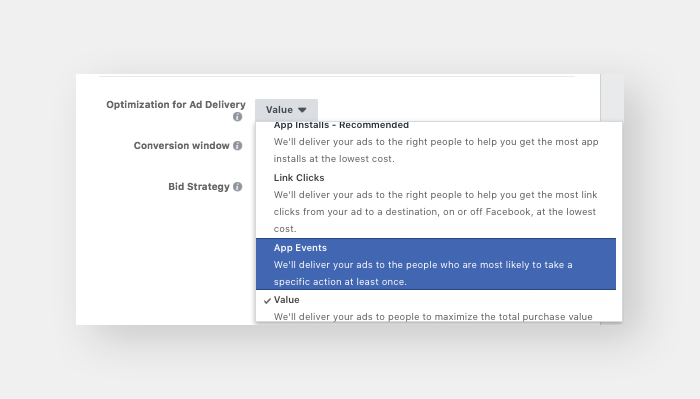 You can get breakdowns by campaigns for app installs and in-app conversions in Facebook Analytics. Additionally, you can measure lifetime value and retention by an ad campaign, ad set, or ad in the App Analytics. ROI Hunter is designed to easily integrate other mobile measurement partners and Google Analytics. This unique feature gives you an opportunity to keep using your current tools while keeping all your data in one place - in the ROI Hunter platform. This requires a simple setup in ROI Hunter as well as on your measurement partner's platform. Then, you will be able to select metrics and customize view in Campaign Manager and on the Dashboard. You can also optimize the campaigns on the metrics from these third-party tools. Continuously testing is crucial as you set up your App campaigns. You want to fully understand which ad specs work best for the audience you desire to reach and which ad creative performs the best. You should create multiple ad campaigns and identify which works best and why. Then continue to optimize from there and use these insights to fuel your ad strategy, design your next campaign and test new variables. You can always create split tests to test Different Bid types, Optimization Goals, Audiences and Placements. Consider looking at our article on Seed Strategy. With automated rules, you can create rules in ROI Hunter which inspect your ads periodically and if they meet the selected conditions, ROI Hunter executes the given Actions on them which you'd normally do manually. Automated rules put more control in your hands at any layer campaigns, ad sets or ads daily. You can even set up the automatic rules on the basis of third party data ie Mobile Measurement Partner or Google Analytics. Check the health of your SDK periodically - The number of app event fires should stay relatively stable across all of your standard events. If you see a dramatic drop in any of your standard events, use FB Analytics tools check on the event and verify that there are no errors causing. Value Optimization - The Value optimization helps marketers target the most relevant groups of potential and existing customers for their campaigns, giving them more efficiency and value from the advertisement. We will probably concur that the most relevant customer is the one which brings the highest value to your business. 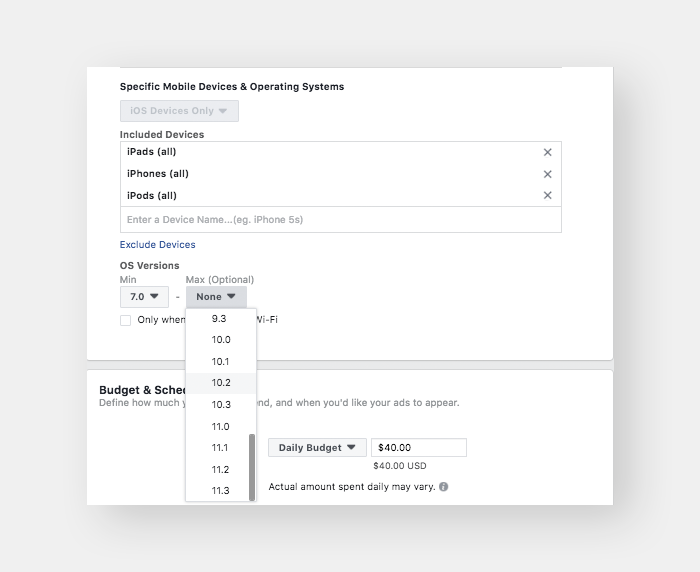 This optimization type works based on the purchase values sent form the Facebook SDK to estimate how much money someone may spend with your business over a particular time period - 7 days. The ad's bid is then automatically adjusted based on this estimation, allowing campaigns to deliver ads to people likely to spend more with your business at a low cost. So there’s a lot you can do with your Mobile App install out of the traditional way. For more information, reach out to your Customer Success Manager today or if you are not a client already, Request a Demo here!